SIBALOM, ANTIQUE – With a gathering of 6,000 people driven to make history, the largest human anchor was formed on 19 January 2016 at the school grounds of the University of Antique (UA), located in the municipality of Sibalom, Antique. The assembly consisted of students from the different colleges, and some faculty members of UA. Celebrating its 62nd foundation day, Dr. Jelyn O. Alentajan, Dean of UA’s College of Teacher Education, stated that their “university has always been ‘anchored’ on quality assurance”. The state university, which was established in 1954 manifested that it shall continuously endeavor to produce excellent students that will serve as catalysts for positive changes, not only in the region, but in the world. UA has a big population of maritime students, with a quarter or 1,500 of them participating in the formation of the human anchor. 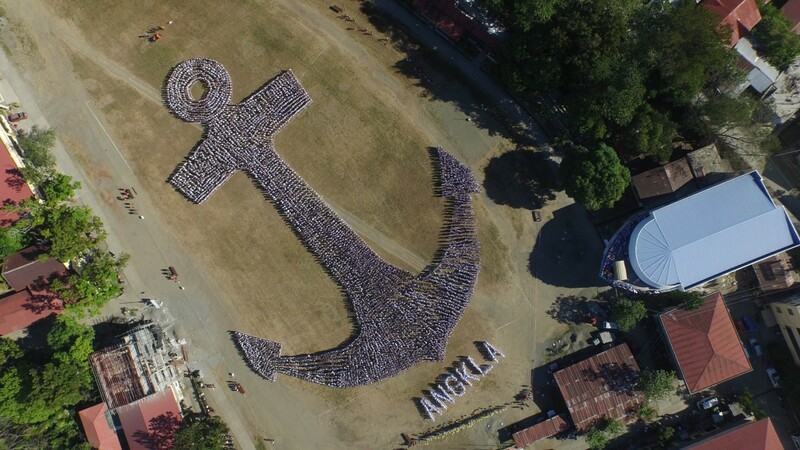 UA partnered with ANGKLA Party-list in achieving this feat of creating the biggest human anchor in the history ever to be recorded in the Guinness Book of World Records. Guinness is yet to issue a certificate that will indeed show that the Philippines has now beaten the low number of 230 people forming the shape of an anchor that it has previously recorded in its books. “We are really pleased to have completed these objectives with ANGKLA. We share in their strong advocacies to further develop maritime education in the country.” Dr. Alentajan said. In response, ANGKLA, the maritime party of the Philippines, represented by Congressman Jesulito A. Manalo thanked UA and its officials. Manalo re-affirmed too that with its measure on the Single Maritime Administration or Republic Act 10635 in place, ANGKLA stands resolute in its commitment to ensure that all Filipino seafarers are always compliant with global standards of education, and of training, certification, and watchkeeping or the STCW Convention. Apart from making a new world record, the formation of the largest human anchor is likewise a symbolic gesture of honoring the Filipino seafarers and all the men and women behind the Philippine maritime industry. “Over the years, our seafarers working on board international fleets have increased in quantity, with 25% of this valuable human component of shipping being Filipinos. Presently, Filipinos are regarded the world’s premier seafarer of choice. Thus, they are among the major contributors to our nation’s socio-economic progress, as their annual billions of dollars in remittances continually grow. They equally provide our country a sense of pride since our maritime professionals play pivotal roles in shipping, which still remains an indispensable mode of connecting the world.” Rep. Manalo stated. ANGKLA highlighted the immensity of the maritime industry it represents, showing statistics of close to 400,000 seafarers deployed by the Philippine Overseas Employment Administration each year, and the country currently ranking 4th among the largest shipbuilders in the world. This sector also brings forth a variety of employment opportunities providing allied and support services including manning or crewing, port, insurance, and maritime education and training. “Given the renowned importance and indisputable contribution of our Filipino seafarers, and the other stakeholders of the Philippine maritime industry, they are befitting to be recognized as our ‘ANGKLA’, providing strength and stability to this beloved nation.” Manalo ended.